Gravity pulls objects towards the Earth. It is what keeps us grounded. In space, there is no gravity, nothing to keep you from floating farther and farther into the universe, the great unknown, until you run out of oxygen. This endless drifting, with death hovering at the bottom of an oxygen tank, is what Dr. Ryan Stone (Sandra Bullock) faces in the movie Gravity. Dr. Stone is hundreds of miles above the planet Earth when debris from a Russian missile strike comes hurtling at the team of astronauts. Their shuttle is ripped apart by the impact. The only survivors are Dr. Stone and astronaut Matt Kowalski (George Clooney). With their communications to Earth cut off, Dr. Stone and Matt Kowalski must make their way together to the International Space Station, where they hope to find help. They have only 90 minutes before the debris, which is caught in orbit around the planet, reaches them again. As they drift through space tethered to one another, they reveal the deeper, core traits of their personalities. Kowalski, introduced in the movie as someone who is easy-going and humorous, succeeds in calming Dr. Stone, while remaining level-headed and methodical himself as he establishes and follows a plan to get them both to safety. Here also, Dr. Stone reveals to Kowalski some of the fears and sorrows that emerged in her own life after the death of her daughter. She displays her inability to let go and move on. The movie really only has these two main characters. Bullock and Clooney carry this movie from beginning to end. Being stranded in space means you are isolated from every other living thing, from everything but silence, which is emphasized by the movie having only two characters floating in front of a vast darkness. The two characters are rarely ever able to touch each other or to be closer than a few feet apart. Also, because of their spacesuits, for a lengthy amount of the movie all you can see are the actors’ faces. Though there are some close-ups, this means a majority of the time emotions are expressed through what the audience hears. Space is silent, and at several points throughout the movie all background noise stops completely. All you can hear are the characters’ talking to each other, or even sometimes just their breathing. The lack of noise builds up the tension of the movie by emphasizing the isolation from everything except the present moment, the current struggle to reach the closest space station. The music starts again or escalates suddenly during and right before scenes that involve some new catastrophe. The music fits into the movie well, serving to increase the intensity and suspense of many scenes. On the surface, Gravity is a movie about an attempt to survive being stranded in space, but on a deeper level it is about a woman’s struggle to survive life. As I said at the beginning, the force of gravity is what keeps us grounded; it pulls us back to Earth. Drifting in space, with only a limited amount of oxygen, Stone has to find a gravity of her own, something to help her pull herself back not only to the planet but to her own life. It was great to watch Gravity in IMAX, which added a whole new level of depth to the vastness of space. 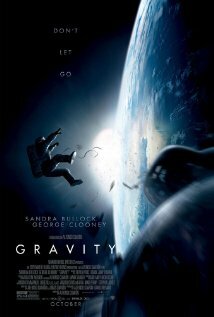 In the end, though, it was the underlying messages about survival and hope that sold Gravity to me. All I had wanted going into the theater was a thrilling ride through space. I got what I wanted, and I also got a message I had not anticipated but definitely appreciated. Whatever motivates you to see Gravity, be it the plot, the actors, the underlying themes or your friends dragging you along, I hope that you enjoy the ride and, just maybe, get something deeper out of it.